Cuban’s book is canonical and, once again, I find myself pulling it from my office bookshelf to assist me in answering a question from a colleague. Teaching, like many professions, experiences tensions between mechanistic and humanistic approaches. But I usually get suspicious when pressed to take sides. Rather than accuse anyone of Luddism (an accusation often hurled at Cuban, and one which he has sometimes worn as a badge of honor) I think it more productive to take a balanced view of the technology of teaching and learning. Certainly teaching should not be adulterated for the sake of supporting “neat” technology and certainly, this often happens. However some of educational technology’s harshest critics forget that the more familiar, comforting artifacts of their work-a-day world are pieces of technology. A computer program is a more complex tool than a blackboard. But levels of complexity aside, both are just tools. Colleagues sometimes accuse me of oversimplification when I assert this view. “A blackboard? That’s not what I mean by technology!” they say. But because the blackboard is ubiquitous we forget that it demands certain things of us: If we’re writing words on it, then it requires all present be literate; if affixed to the wall, then it creates a single focal point and thus influences seating behavior which, in turn, drives other behaviors; it’s mere presence can influence teachers into thinking that they’ve got to have something to place on it when they teach.This tension between early and late adopters of technology bleeds into a debate that really yanks my chain: Is teaching an art, as professed by Cuban, or a science, as detailed in Heinich’s systems approach? To people who spend time on such considerations my response is to ask them if they want milk or cream in their coffee, and to pass them a cookie. Honestly, I can’t even engage. I remember feeling the same sense of pointlessness at the nature vs. nurture debate of my undergraduate years. Must we choose? Can’t people be the product of their environment and their DNA? In likewise fashion I ask: Why can’t teaching be an art and a science? Do people have such little imagination that they cannot conceptualize multiple realities existing at the same point? Sadly, the human mind seems to be hardwired for polarity and it takes effort to think beyond the black and white. But the effort is worth it. (BTW, the “this-vs.-that” of today seems to be whether or not you are a behaviorist or a constructivist. When asked about this my answer is, “Both.”)This is a great little book on the history of technology in the classroom starting from 1920 to the mid-1980s. Cuban includes many interesting quotes illustrating how the glow of new technology has the power to seduce. In hindsight it’s easy for us to judge -- which is part of Cuban’s technique: He invites us to shake our heads and tut-tut at the naiveté of our ancestors. Bad move. Consider the Edison quote in this book: “I believe that the motion picture is destined to revolutionize our educational system and that in a few years it will supplant largely, if not entirely, the use of textbooks.” Okay, I guess we can say that Edison was over zealous in his prediction. But did he get it entirely wrong? I don’t think so. In this instance Edison was wrong in the particular, but right if we take an ecumenical view. One of the most significant achievements in the history of educational technology is military training films. The basic training films of the Second World War were a triumph in training large groups of people inexpensively and efficiently. But to those who rankle at Cuban for being reactionary, my response is to remind them to place his book in the context of the times. Cuban was reacting to educational movements that were so high on technology that some feared that the craft of teaching would suffer. Sure, Cuban has an agenda. He’s pushing the humanistic view. I don’t agree with everything he says, but he makes some points on the misuse of technology that can make a technophile squirm. He also places the use of technology within the context of educational policy and I must say I do agree with him entirely on one important point: Technology in and of itself is not a panacea for all ills. Nice little history lesson about the development, hopes and shortcomings of technology in classrooms from the radio to the computer. The book was written in 1986 so it is really dated in that all it can do is guess what might happen in the 20+ years since - but it's still fun to see what the conversation was in regards to technology as an educational resource then, and how it is still relevant today. In Teachers and Machines, Larry Cuban discusses the use of technology in the classroom since 1920, including film, radio, and instructional television. He describes the top-down implementation of these technologies into the classroom and then examines how and if teachers actually incorporated these mediums into their curriculum. 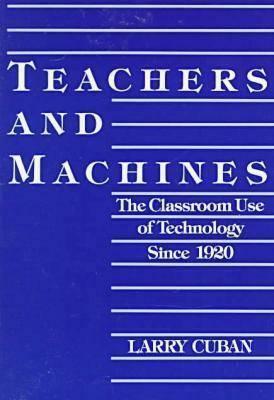 In the last half of the book, he outlines various factors that determine teacher acceptance of machines in their classroom and focuses specifically on the rising usage of computers in schools.After reading this book, I feel more informed about patterns that have emerged in the history of technology usage in education, but I wasn't a huge fan of Cuban's writing style.